Morton Stadium had all lines and events remarked by White Line Services on their outdoor 8 lane athletic track. This entry was posted in Republic of Ireland on January 20, 2016 by Marc Adams. We traveled to Dublin for this project. We set out and line painted for the Institute of Sport. 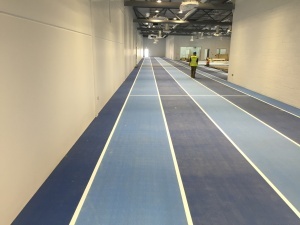 A 4 lane track with a 150m sprint track was made on a new Mondo surface. This entry was posted in Republic of Ireland on September 24, 2015 by wladmin.